A few days ago, my friend Katy wore her Glass to a restaurant in the East Village and started a minor s–tstorm. Management asked Katy to take off the Glass, she took it personally, posted about it, and other Explorers took it personally. The details were creatively enhanced by gossip blogs, but the point is that even laissez-faire New Yawkers are increasingly uncomfortable with wearable cameras. This post isn’t about whether Katy or Feast were right or wrong – that’s been done to death by myself and others. Rather, I want to explore why this fight keeps recurring, and why both sides have such a hard time differentiating Google Glass from a wearable camera. “You gotta take that s–t off, man, it’s violating my privacy”. Last week, I was sitting on the steps of Union Square Park, debugging a Glassware app as I waited for a friend, and someone tapped my shoulder. I turn around and it’s a punk-type guy wearing a Rancid T-shirt, sitting with his friends, all shielding their eyes but looking at me. I showed Rancid the GPS app and my to-do list Glassware. He flipped through the Timeline and saw a few of my texts, but no pictures. He shot his friends a “what now?” glance and they shrugged. He said thanks, said that the GPS app was pretty cool, and they walked off. If you look at what sets people off about Google Glass, the camera is the most common by far. Every major incident involving Glass centers around the camera*, and nearly all the criticism leveled at it points to the camera. You’d think that in 18 months of public use, at least one story would break about a guy walking into traffic while following the GPS, getting in a fight for browsing G+ at the dinner table, being thrown out of a theater for sending voice texts, or being accused of cheating in class with Evernote. In fact, if you cut the camera out of Glass, people seem ambivalent to positive about the product. I’ve been confronted increasingly often, and every person’s attitude has turned neutral or completely reversed when they saw the camera cover. It’s uncanny. If you’ve never seen a person instantly snap from righteous fury to mild curiosity, you’re missing out. What can you do with Glass besides take pictures? Nonwearers don’t really grok that Glass is more than a wearable camera. When I point out that my camera is disabled, they get confused. They react like I’ve pulled the wheels off a bike, totally undermining its purpose. Glass is a fantastic GPS, a powerful weapon against info-overload, a killer memory aid, and a productivity tool, but how could Joe Huffington Post Subscriber ever see that? Google’s marketing always shows the wearer using the camera, almost never an app. If Explorers are supposed to teach the masses about Glass, shouldn’t they cover their cameras too, to show that Glass is more than a GoPro? I floated this at an official Explorer event a few weeks ago and the response was telling. Newer Explorers were all over the camera covers, grabbing a handful in case the first broke. They agreed that reactions to the camera were preventing them from using their other apps in public. Veteran Explorers took one as a curiosity, but declined to use it. Some said that if Glass didn’t have a camera, opponents would attack another part of the product. Some said that they had to help the world get over its old-school opinion of privacy. Most admitted that they only use Glass as a camera – many bought it exclusively to document and share their life and family. They don’t hate Glass per se, they hate the fact that a patron is wearing a camera. When a person feels like his or her actions could be recorded, their behavior changes. It doesn’t matter whether or not the person is actually being observed, and since it’s an emotional response, logic and common sense don’t help. In Glass’ case, the trigger is seeing the camera lens. It’s not the possibility of being recorded that spooked Feast’s clientele, it’s the subconscious response to seeing that lens. 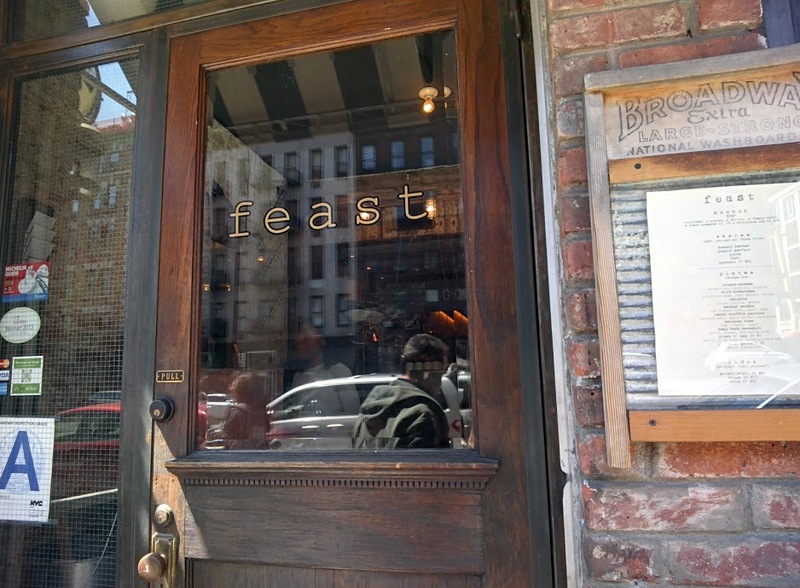 After seeing the Feast story in Valleyrag, I shot the restaurant a few tweets and asked if they’d allow patrons to wear Glass if the cameras were obviously covered. They were open to the idea, and I sent them some camera covers and a nice poster. Will they follow through? Probably not, now that they have an anti-Glass reputation to uphold. What matters is that their management and clientele don’t hate Glass per se, they hate the fact that a patron is wearing a camera. Explorers, show the world that Glass is more than a scary camera. I build wearables and Glassware because they enable wearers to act far beyond their limitations. A wearable app is far faster and more versatile than a mobile app, and can profoundly increase what the wearer can accomplish each day. It’s unfortunate that Google and their Explorers are so stubborn, unwilling to sacrifice a minor feature to ensure that wearables survive into the future. Either way, I’m going to distribute as many camera covers and posters as I can. I’d rather see restaurants and bars ban wearable cameras than ban the whole product. To any Explorers reading, don’t pick privacy fights. Show the world that Glass is more than a scary camera, and I guarantee you’ll see a more positive, enthusiastic reaction. *You could make the argument that the SF run-ins were class conflict, and that Glass-wearers were targeted because of their expensive Google status symbol. This has nothing to do with the technology or the product, so I’m not addressing it here, but it’s definitely relevant. This entry was posted in Cyborg Tech, Google Glass by Yours Truly. Bookmark the permalink. i use google glass to do home inspections, i have already performed over 200 home inspections for teachers, nurses, peace officers, fire fighters, and veterans … i am using glass to help make sure their new homes are safe for their families! that is my ONLY client base, and they see a different side of Glass, they ask if they can wear it (of course! ), they’re amazed when i crawl under a house and they get to see what i see displayed on my phone screen back up in the house, and they see the benefits of this new technology. i think we (more to the point GOOGLE!) need to be doing more to show positive use cases, glass being used in business, glass being used to help others … the silence just allows the negative energy to resonate freely, out of proportion to the level glass is used to do good. i don’t wish to make the case everything is fine, there is discussion that needs to take place, to develop respectful use cases for all these emerging technologies … i just prefer they’re friendly, because the media already does a good job of getting people riled up about issues, so i applaud your approach and suggestions.